Source: Roadmap shows the way for nuclear future "... Nuclear power could become the world's single biggest source of electricity, said a roadmap revealed today by intergovernmental agencies. Industry says the projections are not ambitious enough. 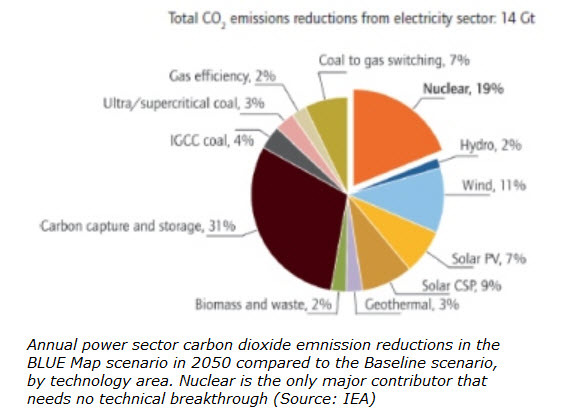 The roadmap for the potential of nuclear in a world that reduces its carbon dioxide emissions by 50% by 2050 was produced by the International Energy Agency at the request of the Group of Eight industrialized nations (Canada, France, Germany, Italy, Japan, Russia, the UK and USA)..."